With LUCIA, Lab.gruppen brings significantly better audio performance and greater flexibility to everyday AV applications, with real benefits for both the end-user and the audio contractor. LUCIA is a first for Lab.gruppen in providing an innovative solution to amplification and processing. This â€˜decentralizedâ€™ approach to AV systems design puts power, processing, control and I/O exactly where itâ€™s needed. 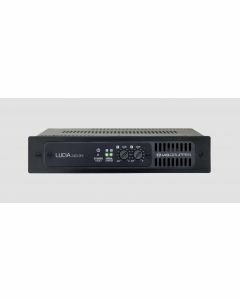 LUCIA facilitates a cost-effective alternative to the conventional approach, where all amplifiers, processing and matrix mixers are located centrally in equipment room racks -- often far removed from the end use location.